Perhaps you are not going to this massive, sold-out conference later this week. Perhaps you are, but don't want to pay the overweight fee on the suitcase of books you invariably bring home from the bookfair. Either way, we've got a deal for you. 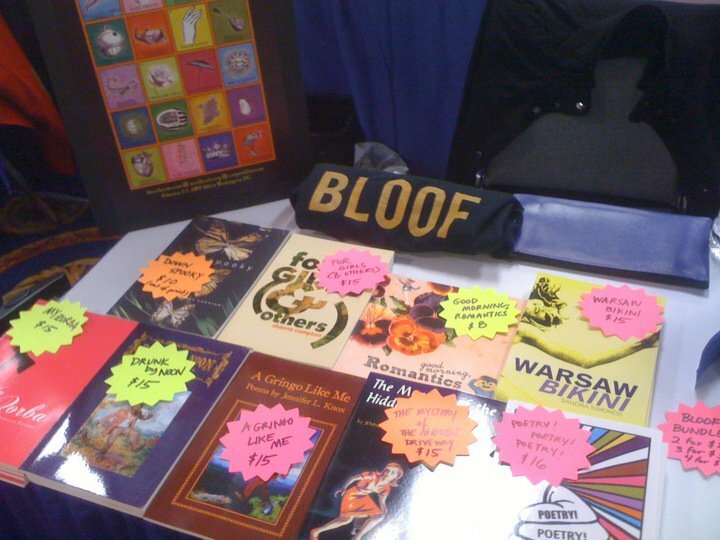 TODAY ONLY, get Bloof Books at the same flat-rate discounted price we'll be offering at the AWP bookfair. PayPal $10 per title to sales [at] bloofbooks [dot] com. Be sure to specify which book(s) you are ordering in the Special Instructions. Offer expires tomorrow morning, 9 AM EST, 2/28/2012.